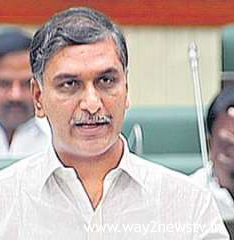 Home News HARISH RAO, WHO HAS SUDDENLY VISITED SRI RAMAKUNDA CEMETERY. HARISH RAO, WHO HAS SUDDENLY VISITED SRI RAMAKUNDA CEMETERY. Siddipet, Jan 9 (way2newstv.in):Minister Harish Rao visited the district center Siddipeta Sri Ramakunda Cemetery on Tuesday morning. The municipal chairman suggested that the plants be planted well in the garden. The municipal officials were ordered to the chairman and the governors to furnish the toys-art on the walls of the cemetery. Later, the minister started a shopping center at Siddipet Agricultural Market Yard. The new year's diary, calendars were organized by the Agriculture Department, along with district collector Padmakar, district agriculture officer Shravan and district marketing officer Nageshwar Sharma. Speaking on the occasion, state heavyweight and marketing minister Tanniru Harish Rao said that the Congress party had no liabilities in the past or the kind of puja of any kind. Last year, 21 lakh quintals were purchased at the cost of Rs. 1031 crores with 95 purchasing centers in the state. The Minister said 106 centers are being set up across the state this year. Asking farmers to meet certain quality standards for buying lingerie, he requested to get moisturized hats because of the 12 per cent support. The minister said the silt and cleaner are available for this purpose. The minister said the government would be responsible for all the charges except the one unloaded at the purchase center. Explaining the possibilities of filling up, betting, saffai, tuft, stitching, lottling, loading into the lorry. Your time should not be enough, and you have to breathe for two days without moisture. The price of Rs. 5450 was sought to be utilized. "We have purchased 21 lakh 5,000 235 quintals of maize from 5796 farmers through maize 10 centers and Rs 30.67 crore to be paid and another Rs.4 lakhs will be paid soon. Similarly, 131 prospective installations for rice have been procured from 90 lakh 40 thousand 57 quintals from 20 thousand 650 farmers and Rs 149 crore 29 lakhs. The TRS government is committed to giving every farmer a favorable price, for which the Chief Minister KCR is a farmer's child and he is working to provide the farmers with support for every farmers.